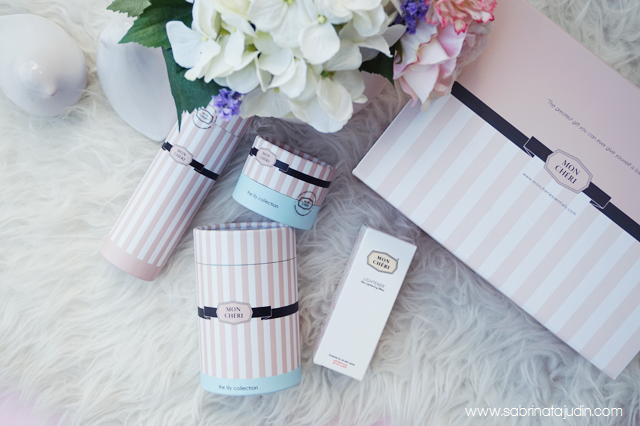 Adorable packaging that that melts away any girl at heart for this set. Come in the mail with a box and as I open it. It just put a smile on my face. 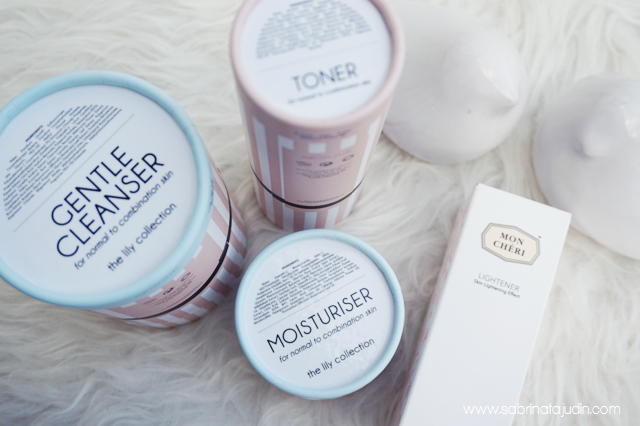 Today post is going to be filled with lots of sweet sweet beautiful skincare called the MON CHÉRI. The set that I got is called the The Lily Collection . MON CHÉRI which is originated from the French heritage, is a skincare line that encourages you to cherish your inner and outer beauty, comfortable with your own skin and basically that confident girl in you. Featured in The Sun newspaper, Caroline Ooi the CEO of Mon Cheri Essentials believe that everyone can achieve healthy skin with these premium skincare line. Now let's get on to the review. Yep, this is how the box came with. The full set in the Lily collection comes in 3 products packed in a hard sturdy box. Each product also we re packed inside a cylinder paper box too. The other extra product I got is the special product called the lightener. Will get to that in this post. 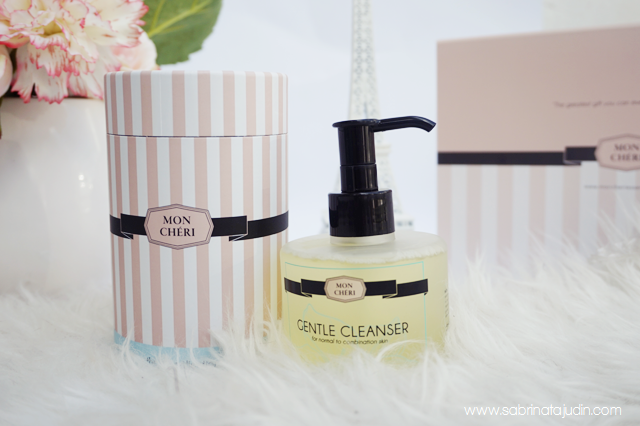 MON CHÉRI Gentle Cleanser (180ml) - It comes in a very convenient pump bottle that is not bulky at all. I put this at the side of my sink and when I want to wash my face, I can easily pump 3-4 drops of the products and lather it up. It has a nice subtle fresh scent and I love how this foam up and lather on my skin. It a pretty gentle cleanser that also helps to remove any light makeup residue on my skin. It said that this cleanser is enriched with natural botanicals, such as White Lily, Aloe Barbadensis & Disodium Laureth Sulfosuccinate . I do find that this cleanser is suitable to anyone who loves a quick cleanse through washing routine. 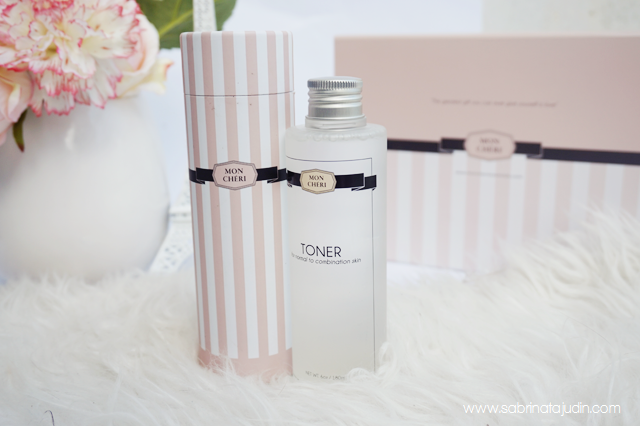 MON CHÉRI Toner (180ml) - I love how this toner smells! It has this fragrance like scent to it that I find very refreshing. The texture of this toner are also a little bit thicker than a usual water based toner. As you wide it on your face, it does not leave any greasy residue. It soothes my skin pretty well. This toner is enriched with botanical extracts too such as Plantago Major Seed extract which helps to repair your skin. It also contains anti aging ingredient such as Pullulan that helps to tighten your skin. It's a great toner to help prepare your skin for the next product absorption which i s the moisturizer. The bottle is made out of a matte finish plastic bottle with a silver cap on it. It also have a hole stopper on the top to prevent leakage. 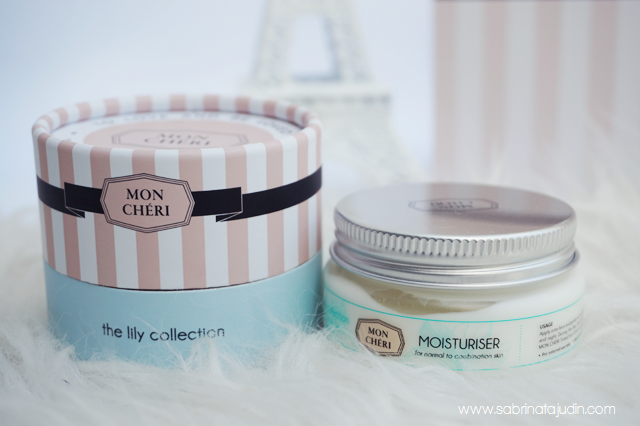 MON CHÉRI Moisturiser (50ml) - The best basic moisturizer every girl should have. It has a light creamy texture that easily blends and absorb to your skin. Makes a great makeup base too. It helps to deeply moisturizes my skin thoroughly. I love to use this during the day when I am not going out. What great about this moisturizer is that it contains fruit extracts such as Apple fruit extract, Red Microalgae, Sacha Peanut extract that contains omega-3. You usually need to eat a whole lot of salmon for the goodness of Omega 3. Now you can have a short cut to that. I don't normally see a skincare contains Omega 3. Omega 3 can help to make your skin brighter and glowing. Anti aging properties ingredient also included such as the Precious essential oils of Geranium and Ylang-ylang that helps to soothe, calm and balance your skin oil production. Your skin can balance out the actual natural oil you need so you can have less oily skin and less dry skin. 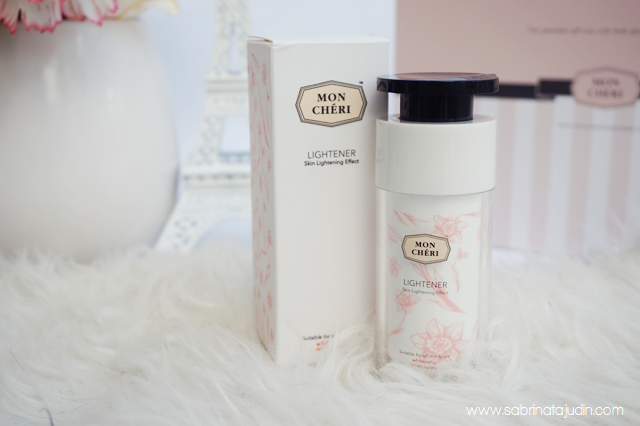 MON CHÉRI'S LIGHTENER (30ml) - The star product! This essential product called the Lightener is suitable to any skin types. If you are looking for a whitening product that feels luxurious on your skin. Check this out. It is specially designed with lightweight formula that said synergistic combination of peptides, niacinamides, plant extracts and natural lactate. All these ingredients helps to combat and gently repairs and improve any dark skin areas on your face. It has a liquid to cream texture. This Lightener also have a spa like rose scent to it. It comes in a double wall plastic bottle with a very pretty floral print. the pump has a debossed heart shape that you will need to twist it first before pumping it out. I use this before any moisturizer I using on that day. It helps to give more hydrating effect to my skin. I'm still giving more time and trying out this product to see of can help to really reduce my acne scars. omg the packaging is really nice! n love your set up .. I'd like to know how the products worked on your skin after a month of using them. I'm considering buying the set + the lightener, so I'm interested to see whether it had a good effect on your skin. I just get a complimentary of mon cherry lightener from a magazine..Omg the texture was very smooth & light on skin.Its hydrates skin very good enough bcoz when i wake up in the next morning,my skin is still bouncy n soft.I love the light roses smell as well.Too much to comment.I will definately purchase this product .Its a must recomanded to pre aging ,dry & tired skin like me. it is a great set, you should try!